We're excited to be participating in the 10th Annual B&O Yorkville 5k on Sunday, September 8th, 2019. If you joined us in 2018, B&O Yorville 5k organizers sent you an email on April 15th, 2019 with your personal registration link. This link will remain valid until May 15th, but don't delay in signing up, this event will sell out. If you didn't run in 2018 but are ready to lace up and run in support of the Helpline, email yharding@awhl.org to receive an early bird registration link. A limited number are available, so hurry! Registration opens to the general public on May 15th. THANK YOU TO EVERYONE WHO FUNDRAISED FOR YOUR OUTSTANDING EFFORTS! Our team of 40 runners surpassed all expectations raising nearly $30,000 and to judge by all the smiles they enjoyed every step of the 5km route through Yorkville on a cool, windy Sunday morning. Next year B&O Yorkville will celebrate the 10th Anniversary of this very special 5km race. Nearly $500,000 was raised this year in support of 21 charities. 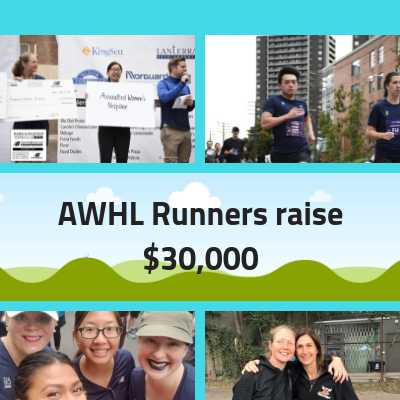 Team AWHL will be back and we hope you'll consider joining us in 2019! For all you runners, may the wind be at your back!